New Delhi [India], Mar 21 (ANI): Union Ministers Piyush Goyal and Dr Harsh Vardhan are among the seven Indians who have been named in the 'World’s 100 Most Influential People in Climate Policy for 2019' for taking steps in order to combat climate change. The list, unveiled on the late evening of March 20, came on the official site of Apolitical, a global network for government helping public servants find the ideas, people and partners they need to solve the hardest challenges. Under his tenure, India saw a massive proliferation of renewable energy through the world’s largest renewable energy expansion programme. He is a 2018 Carnot Prize Recipient for contributions to energy policy. He has also played an integral role in making India a leader in environmental preservation. In 2008, he launched the anti-plastic bag campaign in Deli and the "Green Shopper Campaign", which promotes business partnerships with manufacturing of environment-friendly products. Mukta Tilak, who is Pune's mayor, is the wife of renowned activist and freedom fighter Lokmanya Bal Gangadhar Tilak's great-grandson Shailesh Tilak. Under her leadership, Pune banned all dumping of solid waste and implemented measures to cut down on carbon and improve air quality. On account of her work, Pune received the Award for Innovative Policy at the 2018 Climate and Clean Air Awards at the Global Climate Action Summit, according to her profile on the website. Jyoti Kirit Parikh is the executive director of Integrated Research and Action for Development, a research and policy analysis institute focusing on sustainable development. She was a member of the Prime Minister’s Council on Climate Change in India and has served as energy and environment consultant to the World Bank and the United Nations Development Program. In 2007, she was awarded the Nobel Peace Prize as a member of the Intergovernmental Panel on Climate Change, it read. Sunita Narain, a well-renowned environmentalist and political activist, is the director of the Centre for Science and the Environment and the editor of the fortnightly magazine, Down To Earth. In 1985 and 2012, she played a key role in the creation of the State of India’s Environment Reports and, in 2005, was awarded the Padma Shri prize by the Indian government. Narain is a strong advocate of the importance of local democracy in climate issues. She is the recipient of the World Water Prize, on account of her work on rainwater harvesting and its influence on community water management policy, and was listed in Time Magazine’s list of 100 most influential people in 2016, her profile on the website stated. Another environmental activist, Vandana Shiva, was among those mentioned in the list, whose work focuses on promoting fair and sustainable agriculture. She is the founder of the Research Foundation for Science, Technology, and Natural Resource Policy, an organisation designed to develop and promote sustainable agricultural methods, and Navdanya, a movement committed to biodiversity and farmers’ rights. Shiva is the author of Making Peace With the Earth and an advisor to the Women’s Environment and Development Organisation, as well as several government bodies. Among her many honours and awards is the Right Livelihood Award of 1993, it read. 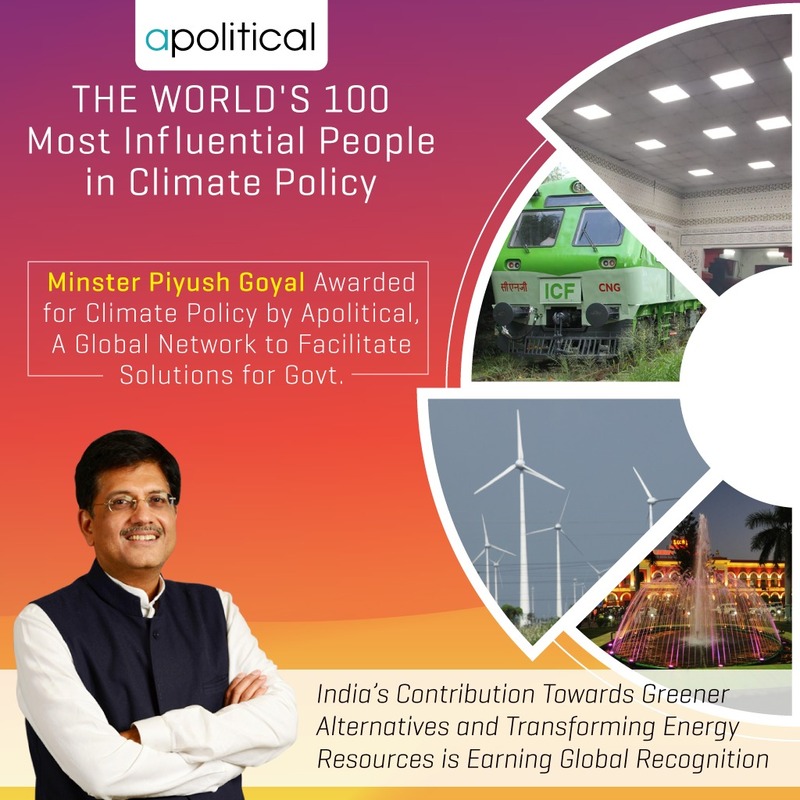 Upendra Tripathy is the director general of the International Solar Alliance, a coalition of over 100 countries dedicated to increasing the use of solar power and reducing reliance on fossil fuels. Tripathy joined the ISA in 2017, after serving as the secretary of the Ministry of New and Renewable Energy in the Government of India. He has over 36 years experience in the public service, and in April 2009 received the Prime Minister’s Award for Excellence in Public Administration. Meanwhile, Varshini Prakash, a 25-year-old Indian-origin woman, whose parents are from India also made it to the list. Prakash was born and raised outside of Boston by parents who originally hail from Hyderabad, India. She is the co-founder and executive director of Sunrise, a youth-led movement advocating for political action against climate change in the United States, her profile from the website read.